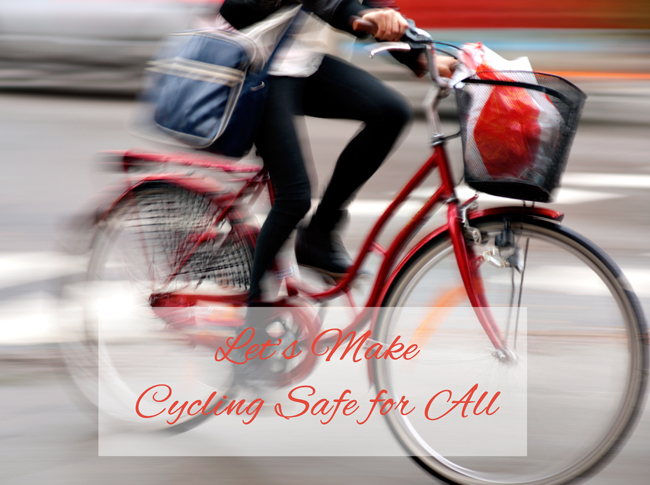 Your safety when bicycling on community streets roadways and bike paths depends on you. Because the law gives you the same rights and duties as the motoring public, you are required to follow the rules of the road to ensure your safety and the safety of others wherever you ride. It is crucial that you obey stop signs, traffic signals and roadway demarcations. Following the law is essential to cycling safety. The following rules will help you prepare for a safe bike commute day or night. Your safety is greatly enhanced if you make your intentions clear to everyone in your surroundings when riding your bike on the roadway. Always ride in the direction of traffic and stay in the far right open lane that moves traffic in the direction where you are heading. Cycle in a straight line and avoid swerving between or around parked cars. Make sure to signal every turn and lane change, and always look behind you long before making any changing movement. Most cycling accidents are the result of a driver not seeing the bicyclist in time to take appropriate action. To avoid serious consequences, be conspicuous. Wear bright clothing and ride only where other motorists, pedestrians and cyclists can see you clearly. When riding in areas where visibility is poor, ensure your bicycle is equipped with a white front light and a red rear light. Equipping the bike and your clothing with reflectors can maximize your appearance both day and night. Make eye contact with truckers, motorists, other cyclists and pedestrians. This can help others spot you in congested areas while providing valuable non-verbal communication to indicate your intended movement, and theirs. The safest bicycle riders on the road are those who have the ability to anticipate what actions other cyclists, pedestrians and drivers are about to take. Staying alert can help you recognize the intentions of others on the road before they turn, park or change lanes. When riding along streets with parked cars, move the bike safely to just outside the car door zone. This movement will help you avoid the hazard of hitting a car door as it opens. Search for potholes, debris or dangerous condition in the street and make a safe course correction to avoid coming into contact with the road hazard. Never ride your bicycle on the sidewalk and always cross railroad tracks at a perpendicular or right angle. Before heading out, even on a short trip, it is essential to be “cycle ready.” This involves checking the tires to ensure both have sufficient air. Make sure that the chain turns smoothly and that the brakes work properly. If the bicycle is equipped with quick release levers, make sure that they are closed securely. Take every necessary tool and supply you might need along on the roadway and always wear a helmet. Practicing cycling etiquette on the roadway can increase your safety and enhance your cycling experience whether you are on your bike for exercise, enjoyment or commuting to work or school. The following cycling etiquette tips can help. Avoid swerving in and out of traffic or changing your direction suddenly or unexpectedly without signaling. It is not only dangerous but also bad etiquette. When available, use community bicycle routes, cycle boxes and advanced stop lines when it is safe to do so. Some communities offer dual pedestrian and cycle crossings that are clearly marked on the roadway. While is not mandatory to use these bicycling features, they can significantly increase your level of safety on the road. Respect pedestrians along your pathway. It is essential to always yield to walking traffic. This is because some pedestrians have a hearing or eyesight impairment and may not have the ability to detect your presence. When possible, signal your presence to other cyclists, pedestrians and motorists by using a bell or horn attached to your handlebars. Every year, more than 50 million Americans take to the nation streets on bicycles for transportation or fun. Nearly 10 million of those cyclists consider themselves a professional or amateur “active cyclist” in off-road riding, commuting or as a weekend rider. In response to the number of cyclists on the roads, many communities have enacted specific laws that govern bicycling to ensure everyone understands the rules of the road. When a bicyclist is involved in an accident involving a commercial vehicle, car or truck, it is not assumed that the responsibility with fall to the motorist. Claims filed for financial compensation are usually successful when it can be proven that driver’s negligence caused the injuries and damages to the cyclist. However, if a personal injury attorney can prove that the cyclist was following established riding practices or avoiding a road hazard, they may be entitled to recompense for the injuries they have endured. Only a few states in the nation have enacted mandatory helmet use by bicyclists. Some states require children to wear a helmet, and others have no restrictions at all, including Illinois. For many cyclists, riding their bike is a cherished and healthy way of living. Because of that, it is imperative to maintain the rules of the road to make the streets safer for everyone.